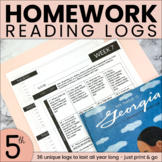 Weekly Homework Reading Log - Editable! 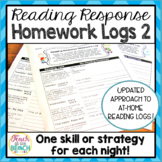 On this reading log, students complete a different response activity each night. 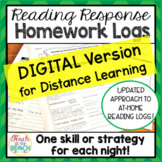 On Monday, students "Read for Fluency"; on Tuesday, students "Read for Understanding"; on Wednesday, students "Read for Fun"; and on Thursday, students complete "Non-Fiction Reading". 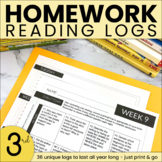 This simple reading log allows students to record their reading homework throughout the week. The days are listed from Monday through Thursday. 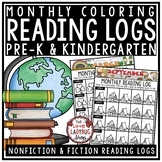 Each month is represented with a fun font and clip art. 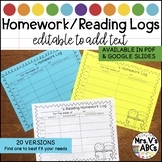 Thank you to www.mycutegraphics.com for the use of the clip art! 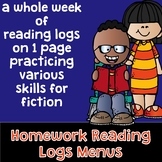 Winter Homework: Reading Log with Sentence Stems This reading log is for literary text: literary nonfiction, poetry, drama, fiction etc. 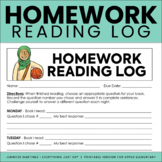 Use this simple reading log to keep track of student homework. Students simply draw and write about their favorite book.